The city of Montemarcello offers you a lot of activities to do such as hiking, swimming, riding a bike as well as relaxing on the beache. You will surely like your holiday in this city in Liguria, Italy. Located in the middle of the Montemarcello-Magra nature park, you will find charming hiking paths and fascinating bays in this locality. From Montemarcello, you will reach one of the most beautiful beach-bays in the surrounding region - the Punto Corvo. To get to the bottom of the steep coast you will have to go through several steps (approx. 700 of them). You will be rewarded with the unique beauty of the wild bay. During summer you can also get to the bay by boat from Bocca di Magra or Fiumaretta. You will find a small grocery shop as well as a Trattoria in Montemarcello, where you can enjoy the local culinary delights. For bigger shopping facilities and beaches you can go to the next nearby towns, e.g. to Bocca di Magra, Ameglia or Lerici. 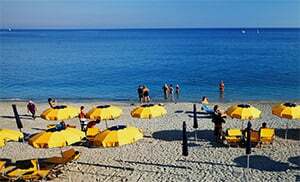 Montemarcello is an excellent starting point for excursions to the famous Cinque Terre, to the nearby neighboring region of Tuscany and to the marble mountains of the town of Carrara. The hilly region called Caprione separates the Gulf of La Spezia from the plains of River Magra. There you can visit the botanical garden on Monte Murlo, admire the rich variety of local plants and enjoy a lovely view of the Apuan Alps and that of River Magra’s estuary. Montemarcello owes its name to the Roman Consul Claudio Marcello. This mountain village is part of “Borghi piú belli d'Italia” - the most beautiful villages in Italy. The village fortifications and church date from the 15th century. There is even a circular tower in the northern part of Montemarcello which was built in those days for defense purposes. You will find some ruins of a military fort in the southern part of the village. From Montemarcello, you can reach Bocca di Magra through an old Roman street which is still paved with old stones. Or you can go and visit the archaeological excavations and the Roman amphitheater in the nearby town of Luni. The regional park of Montemarcello–Magra, which surrounds the villages with its ample green vegetation, has been in existence since 1985. Although Montemarcello is located on a hill, many of its traditional dishes come from the sea, e.g. octopus (polpo) or dried cod (stoccafisso). The "tagiain a menestron" is also a typical dish: soup with seasonal vegetables and home-made pasta. It is accompanied with wine from the region: Vermentino dei Colli di Luni. The original village of Montemarcello lies not far from the border with Tuscany, between the estuary of River Magra and the Gulf of La Spezia. When coming from the direction of Genoa/Milano on the A12, take the highway exit to Sarzana, and from there turn onto the SS1; follow the signposts towards Bocca di Magra and then branch off to the SP432 at the next junction. You will then follow the Magra river which runs on the left-hand side of the road through the village of Ameglia, and after crossing the Via Giacomo, you will turn right towards Bocca di Magra la Ferrara at the next junction and then on to the Strada Provinciale 30. Thereafter you will follow that road past Bocca di Magra and then branch off to the SP28 - the Via delle Pace; this road runs uphill until you get to Montemarcello.